Extend your digital HDTV signals an extra 65ft. 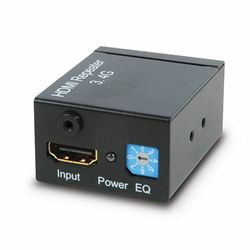 with an intelligent HDMI repeater/equalizer. It electronically regenerates the signals sent by HDMI equipment. (like your Blu-ray Disc® player) so that you can greatly augment the typical HDMI 50-foot cable run. Includes mounting lugs. HDMI cables not included.